Bürkert's modular solenoid valves now meet current explosion protection requirements. Bürkert is at Valve World Expo this week showcasing its modular solenoid valves which now meet current explosion protection requirements. 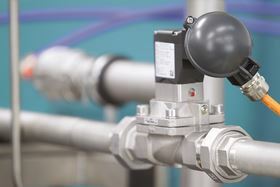 Solenoid valves used in potentially explosive atmospheres need to be both strong and reliable, as well as adaptable to different areas of application and must conform to the corresponding approvals and directives. Bürkert has now enhanced its programme of modular solenoid valves to meet explosion protection requirements. The result is a modular coil and valve concept that now also takes NEPSI and KOSHA specifications into account and explosion protection requirements in accordance with the ATEX and IEC standards relating to explosive atmospheres. The Bürkert team will be in Hall 5, Booth D40 at the Valve World Expo Dusseldorf until 29 November. The new addition ELEMENT neutrino analytical transmitters are designed for use with different sensor types. Burkert Fluid Control Systems launches Type 8081 ultrasonic flow transmitter. The new construction improves the seal's ability to handle extreme operating conditions. KSB Aktiengesellschaft has updated its Etanorm SYT single-stage volute casing pump series.